Blog Transform your Living Space…Overnight! 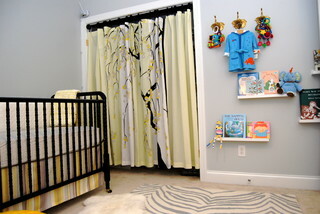 You can create drama, texture and color by hanging curtains in unexpected places. Here they are used to hide clutter, but can also be used for creative accents on bunk beds! This works in every room, in built-ins or stand-alone pieces. It’s a great way to update and personalize old furniture, and it works for the homeowner who is hesitant to paint her entire wall. Go for it. Move it around. If it doesn’t work as you thought, move it again. Make sure everything is not just pushed against the wall. This is the most common “mistake” in decorating. Think about creating intimate spaces within a room rather than setting up a whole room. What is the focal point? You can have more than one. When you are standing at the entrance to the room, is it inviting you in? Switching accent pillows can change the entire mood and look of a room. This mishmash of colors and textures adds playfulness to this otherwise formal room.